I feel compelled to apologize for the recipe I’m about to share, so I’ll just cut to the chase. It’s messy, and time consuming, and dirties far too many pots and utensils than any one-dish meal should call for. If an enthusiastic, Dodin Bouffant-wearing seven-year old helps you out? It turns into a scene right out of Shel Silverstein poem. Spaghetti, spaghetti, all over the place . . . But here’s the thing – it’s really good. Also! it’s especially suited to the extreme wintry weather we’ve all been experiencing. Nothing says ‘comfort food’ like a pan full of smooshed spaghetti, right? What I’m trying to say is that I’d remiss if I didn’t share this with you. This recipe has lots of steps and ingredients because that’s how I unwind when the weather forces me indoors. If you’re in a rush, though, the basic equation for this dish is: 1 box spaghetti + (1/2 C red sauce blended with 1/2 C cashew cream cheese) = spaghetti pie. If you’re using gluten free pasta, you’ll want to cook and drain it just before mixing with the sauce. If you use semolina pasta, you can use leftover or fresh noodles. This calls for cashew cream cheese – plain ol’ cashew cream (super thick) works just as well; store-bought vegan cream cheese would probably work, but I don’t know how it would taste. Lightly oil a baking dish, 8 x 8 inches-square or something approximate to that size. If you need to caramelize your onions: slice your onion into half-moons, and then slice those into 1/2-inch pieces. Heat a heavy-bottomed pot over medium heat and add a teaspoon or two of olive oil. When the oil is hot, add the onion and toss to coat; add a pinch of salt and toss again. Stir frequently until the onion has first softened, then browned, then turned a deep caramel hue. Scrape your pot as necessary when the onion sticks, and use a couple tablespoons of water or white wine if needed to deglaze your pan while your onions finish caramelizing. 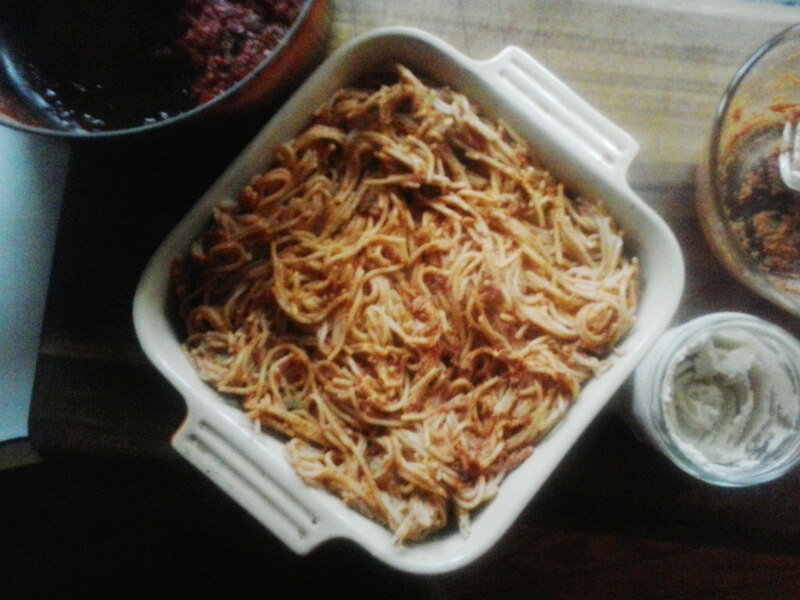 If using pre-caramelized onions (I actually keep jars of 24-hour slow-cooked caramelized onions on hand because I am a food nerd), add them to a cold, heavy-bottomed pot and place over medium heat. Once the onions have warmed through, add the herbs and mushrooms. Stir for a couple of minutes to sweat out most of the moisture, then add the kale. Add a generous pinch of salt and a few grinds of fresh pepper. If you don’t live with a couple of spice-phobic wimps, add a large pinch of red chili flakes, too. Stir frequently until the kale has softened and everything is starting to stick. Use a big splash (or three) of your favorite red wine to deglaze the pan, scraping as you go. Add the crushed tomatoes and bring to a simmer. Cover partially, leaving the lid ajar to let steam evaporate as the sauce thickens. While the sauce cooks down, preheat your oven to 375 F / 190 C and make your spaghetti. If making gluten free spaghetti, this is what I do to keep it from sticking after it drains. I bring a kettle (or small saucepan) of water to a boil, and then immediately after draining my pasta in a colander, I pour the hot water over it for a second rinse. Works like a charm! Return your cooked and drained pasta to it’s pot, and toss with a tiny bit of oil if you’re worried about it sticking. Turn the heat off from under your sauce. In a medium bowl combine 1/2 cup red sauce with 1/2 cup cashew cream cheese and stir to combine. Toss this with the pasta until the spaghetti is uniformly coated. If your spaghetti is too dry, add up to 1/2 cup additional red sauce. You only want enough sauce to coat the pasta, though, not to saturate it. Turn the spaghetti into the oiled baking pan, tucking in any stray noodles so that the top is relatively flat. Add a thin layer of sauce over the top, taking care that every noodle is covered. Unless you like a few wispy crispy edges, which I do – then by all means, leave a few tendrils unsauced! Sprinkle the surface lightly with sugar – just enough to bring out the sweetness of the onions and tomatoes. Bake for 30 minutes, covering lightly with foil if your sauce starts to brown. Let the pan rest for about five minutes after you remove it from the oven.